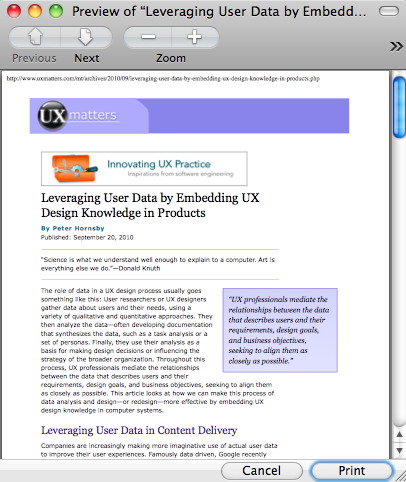 A few months ago I contacted UXmatters online magazine to let them know of a problem I had printing out articles with Firefox. The first page would print, but that was all. I could switch to Safari and print fine, but that just didn’t seem right. I found out that they were a little shorthanded on specialized web help, so I volunteered to assist. Pabini Gabriel-Petit, the publisher and editor-in-chief, graciously accepted my offer. Creating print CSS is usually simpler than web page layouts, because the goal is typically to have the content of the page print out well on standard size paper. 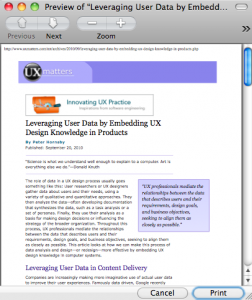 Multiple columns and site navigation are usually uncalled for. My first try was to revise the existing print CSS file. After half an hour at that, I decided it would be simpler to start from scratch. The original print CSS was quite complex, and it seemed I was searching for one issue: why did the pages stop printing after page 1? So I rewrote the CSS, simplifying the CSS code greatly. I had the layout in good shape, but oddly still had the 1 page issue. I went back to the main screen CSS file and begin sifting through it, looking for clues. Then on a hunch, I found the issue. The global CSS file is thick. There’s a ton going on there to defend against various cross browser issues. One particular rule I saw repeatedly was the use of overflow: hidden. That rule is used for a few reasons, but one of them is to force a floated box (div or what have you) to expand when it wants to collapse, vertically. This allows things like backgrounds to show through properly. One of the selectors that this rule was used on was actually a wrapper for much of the page content. It made sense to me, in a way, that this could confound a browser into hiding paged content that went beyond a page. So the real key to the much simpler CSS file was to add in an overflow: visible to a large set of selectors to override that overflow: hidden for printed pages. I sent Pabini the new code, and over the following weeks she tested it and added some details I had missed. About a month ago she deployed the new print CSS code to the website. This little evening project was a fun puzzle, and I’m glad I was able to help make such great content on the UXmatters website print out better for more people. Author Davin GranrothPosted on September 29, 2005 Categories User experience, web, technologyTags code, CSSLeave a comment on Why use CSS-based layouts?